I had the incredible honor of being asked to teach my seminar Chasing Sustainability at PeaceJam 2008 today and I can't even begin to tell you how amazing it was. Peace Jam is an organization started 12 years ago by two folks from Colorado, Dawn Engle and Ivan Suvanjieff who had a simple idea. Why not get Nobel Laureates to get together and help inspire young people all over the world to fix the problems that they see in front of them. While most people would have stopped right there, thinking the task too hard and the hurdles too big, Dawn and Ivan pushed ahead and contacted the Dalai Lama who loved the idea. They then began to cold call Nobel Peace Prize winners and pretty soon, had an organization on their hands with the simple goal of changing the world by inspiring young people. I taught my course in the morning to a small group of kids (a last minute venue change kind of messed things up) but had a great response from them and subsequently ran into a number of people who had wanted to attend but couldn't find the venue. Such is life, you can only control what you can control, but it was a good seminar nonetheless. The highlight of the day for me though was attending the press conference and being able to listen to the Laureates in attendance speak and answer questions. It was truly inspiring. Archbishop Desmond Tutu, Rigoberta Menchu Tum, Betty Williams, Jody Williams, Shirin Ebadi, and Adolfo Perez Esquival, all spoke eloquently about their experiences and their excitement at being involved. What struck me most about these amazing folks was that they were just regular people. While they have all accomplished amazing things, they are just normal everyday people who would not tolerate injustice and stood up and said no. Their message was clear and simple - Do Something! They were totally inspiring! Imagine what the world could be like if everyone acted this way! The Laureates and Dawn and Ivan (who may be Peace Prize winners themselves soon as they have been nominated) announced the start of what they are calling the Global Call to Action, a ten year intiative to enact 1 billion acts of peace throughout the world that attack the 10 core problems the group has decided are most problematic to the planets survival. It's a really amazing campaign and one they have already had a lot of success with. Any child can sign up by going to the site and you can read accounts of projects that the laureates have undertaken with the kids who have come up with them. I could go on and on, but I won't. It was an honor to be among such genuine leaders and be a miniscule part of what they are trying to accomplish. Pretty amazing stuff. I'll post the audio as soon as i have it cleaned up so you can hear for yourself. I just realized that today is Sept 11th. It's not that i didn't know it was coming up, moreso that i recognize that it's an arbitrary date even though it has extreme historical significance, in the realm of my lifetime at least. Now that I think about it, i remember vividly the thoughts of that day, the moment i heard, everything that was happening and I never want to feel those feelings again. So I'm sending this out and asking one small favor. Just take a moment today, close your eyes, and think deeply for 5 seconds, 10 seconds, a minute if you don't have kids, whatever works, about Peace. And i don't mean negotiations, or treaties, or anything political, I mean real Peace, a state that our children could grow up in and never have to hear the words war, hatred, enemy, or atrocity again. It may do nothing more than to give you a moments peace, but then again, it just might. I was driving in the car yesterday listening to the radio and there was a story about obesity becoming a problem in Iraq. It seems that as a result of the violence there, a large number of Iraqi citizens choose to leave their houses only when necessary and as a result have become quite sedentary. Add to this the ability to have TV in there houses and the picture gets much worse. The reporter at one point asked the local correspondent whether people would consider having a tread mill or exercise bike in their houses. While I expected to hear the answer that this is not foremost on most Iraqis minds right now, what he said was that there are some who would like this, but since intermittent power is a problem, treadmills don't work most of the time. Now i know there are bigger issues in Iraq right now, but how backwards is this? You have a group of people who need, among other things, electricity and exercise right? 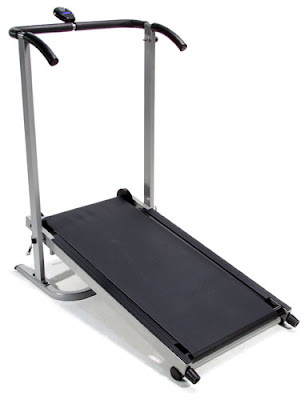 Why not reverse engineer some of those treadmills and have them charge batteries that can be used later when power is needed? I know it's not that simple, but on the flip side, maybe it is. As I posted a few weeks back we were back east visiting relatives for a bit. As is often the case, you can learn a lot about your specific environment simply by being out of it and this trip was no different. I was helping my mom make dinner one night and as she was opening some plastic containers I noticed that she was throwing them in the garbage. I pulled them out (in order to bring them home with me, but also as a way of making a point) and in a way that only a son who thinks that he is always right can say to a mom who is used to a son who thinks that he is always right said "Mom, you have to recycle these things, you can't throw them in the garbage, it's horrible." At which point my mom said, in a way that a mom can say to a son who thinks that he is always right but rarely is "Of course I know that but those are not number on or number two and we don't recycle those here." And that's when it hit me. I sort of stepped out of myself for a second and watched as the virtual cinematic camera that can be my brain zoomed into my shocked expression as the music from Psycho payed in the background. It suddenly made me realize how lucky we have it here in SoCal. Ya see, recycled numbers 3-7 go in the garbage back where they live, not because they are not being cognizant, but because the government doesn't recycle anything but 1 and 2. Quite shocking. I've always taken this for granted but having stepped outside my surroundings for a bit realized how truly easy we have it compared to most. Quite an eye opener. For more info on LA recycling, check out this site. As you may have gleaned form the odd assortment of trash & recycling from this weekend, my wife and I took the girls camping. This is a twice yearly event for us with a large group of really cool, slightly eclectic, and ever growing set of folks who have been kind enough to include us in there bi-yearly outings. I really love camping for a lot of reasons. There's the smell of course, campfires, the fresh air coming off the ocean, and the general two day funk that one gets from kicking up dust clouds all day every time you take a step. There's the wildlife - our friend Bob caught a frog, a coyote pup serenaded us for a few good hours last night, and my youngest caught a stink bug and proceeded to show it to EVERYONE who would look. The camaraderie is of course great as everyone sort of shares what they have and then, after the kids settle down, the adults all gather around the campfire to sing songs that really are as bad as they seem, but now, 20 years after they were hits, they seem much better (the beer helps a little too - Macarthur Park as a squeezebox/guitar arrangement anyone?). And of course, there's getting to sleep in the tent with Biscuit which brings me full circle back to the smell, but I'll leave that one alone for now. This trip however, I discovered something entirely new and altogether amazing, at least for me. I hadn't seen a number of these folks for a year since the last trip was when i was home with my Dad's accident, so of course, the subject of 365 came up. As i explained what i was doing over and over (i don't mean that to sound tedious as I actually enjoy explaining it to see peoples reactions and thoughts) I was struck by an interesting and altogether enlightening concept. Here we were north of Malibu camping and we were packing up to leave. Now i've always been taught that as a good steward of a campsite, you need to leave it in the state you found it, pack out what you pack in, and generally be responsible for all of your waste stream and impact on the site so as to leave no imprint. And it suddenly occurred to me that this in essence is a microcosm of sustainability, or at least one facet of it. Here were all these various and sundry people - government employees, stay at home moms, visual effects artists, kids, rock climbers, actors, photographers, filmakers, opera singers, stage combat veterans, and even a trash hoarder and his awesome dog, and they were all, in this little microcosmic setting, abiding by the rules that we should all be doing with our entire lives. They were packing out what they packed in, to a point anyway. How cool would it be if this was how we all lived our lives on a grand scale. It's really William McDonoughs Cradle to Cradle in a nutshell - you show up on this planet with nothing, use what you need while you are here, but use it in a way that it leaves no negative imprint when you are gone, leave nothing behind. A bit stark I'll grant you, but interesting nonetheless. I honestly don't really know where this goes from there, and wish that it had left me with some big "aha, I get it moment". Perhaps some of the folks who were camping will add something i may have missed. Nonetheless, it was fascinating to think that there are areas of our lives where the rules do apply as they should. Perhaps we just need to look at them a little farther and take them into our daily routines.